As the first generation born in the digital age, major corporations and analysts have spent years decoding the mysterious Millennial consumer. More recently, the Millennial’s younger counterparts known as Generation Z is the newest group of mass-market consumers reshaping how companies approach customer experience design. While both generations share some of the same behaviors and characteristics, they have distinct preferences that will be important to address as companies are forced to deliver traditional and digital customer experience options for both. A “Millennial” is a term generally used for individuals born in the early 1980’s through the 1990’s. Millennials are given credit for being the most open-minded and socially conscious generation that have grown up in a time of rapid change. Over the last decade, the Millennial generation has significantly influenced how companies transformed their approach towards customer experience, with a focus on technology and social media as a means of engaging with their customers. Generation Z consists of individuals born in 1995 or later and are the first generation to not have known life without technologies such as smartphones, iPads, Facebook and Instagram. According to Nielsen, this generation is the largest single population segment and biggest influencers contributing to $44 billion of the American economy. By 2020, they will account for more than one-third of the U.S. population. While Millennials have been pegged as being entitled and lazy, a recent study found that 69% of Gen Zers said that their achievements will come from hard work, which is a stark contrast from the Millennial. Companies are also seeing this disparity in their purchasing and customer engagement preferences. Understanding the differences between both generations is critical in preparing companies and adjusting leadership to adapt to the customer experience expectations of the newest consumer population. According to a recent Forrester study commissioned by American Express, when comparing responses to a survey between Millennials and Gen Zers, Gen Z is more accustomed to interacting with the world on their mobile phones and expect full mobile functionality. While the top 3 preferred channels of engagement between the two generations are the same: over the phone, via email and in person, 55% of Gen Zers prefer to access product information digitally. This is where customer experience design has shifted towards self-service and automated engagement options. As we take a look at how to retain the Gen Z customer, the traditional loyalty rewards programs are not as effective as with prior generations. According to a report published by Ernst & Young, only 30% of Gen Z consumers see loyalty programs as apositive thing. Gen Zers rely on peer-to-peer interactions and social media where brands are shared, liked and mentioned, thus influencing their longevity as a customer. Brand loyalty for Gen Z is less about a program and more about the brand experience. The Millennial and Gen Z customer are similar in many ways. They both want secure digital experiences. While Gen Zers may crave highly personalized experiences on social media, they are also very keen to protect their privacy. Customer Experience leaders need to make sure they are connecting with Gen Zers on their terms, so they don’t come across as overly invasive. According to IBM’s survey Uniquely Gen Z, less than one-third of teens say they are comfortable sharing personal details other than contact information and purchase history. However, 61% would feel better sharing personal information with brands if they could trust it was being securely stored and protected. The Gen Z customer values quality over price and wants to be engaged with a company across all channels. Brands like Nike, Netflix, and YouTube, have successfully stayed ahead of the Gen Z curve by offering experiences that are conversational in style, easily accessible, shareable, secure and controllable. 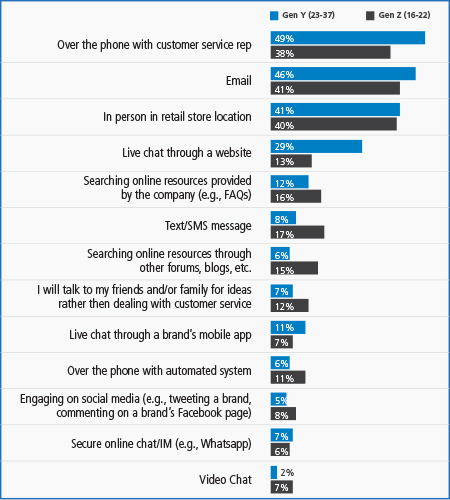 Brands and customer support teams will need to become more customer obsessed. Ignoring the distinction in customer experience preferences between the two generations can result in significant missed revenue opportunities as the Gen Z consumer continues to mature.